mackenzie EXHIBIT is proud to announce that the Vibram booth at FN Platform 2018 has officially been awarded the Most Innovative Use of Space Award. We relish the opportunity to work with such inventive and creative companies such as Vibram and look forward to working with them to create many more iterations of award-winning booths in the future. 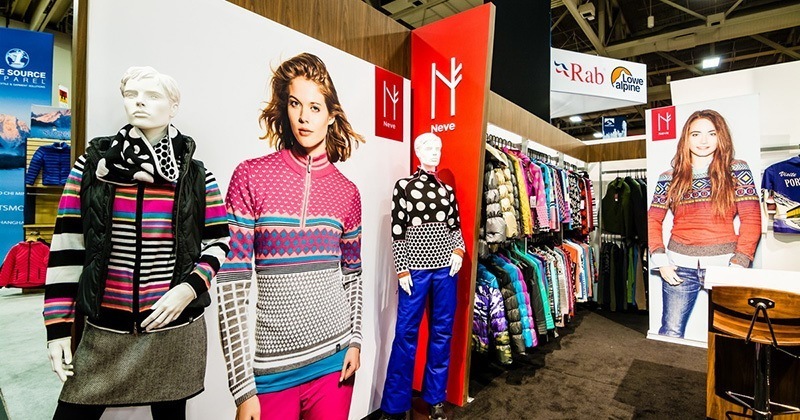 FN Platform is a chance for leaders in the footwear industry to gather together to share ideas and fashion-forward creations that provide inspiration for the global market. These companies represent the best-of-the-best from over 30 countries and showcase designs for men, women, juniors, and children; needless to say, competition among these creative companies is pretty strong. Because FN Platform represents a concentration of some of the most respected footwear brands in the world, it’s even more impressive that Vibram was able to so clearly stand out and win the Most Innovative Use of Space Award. Vibram booth at FN Platform 2018 wins Most Innovative Use of Space Award. 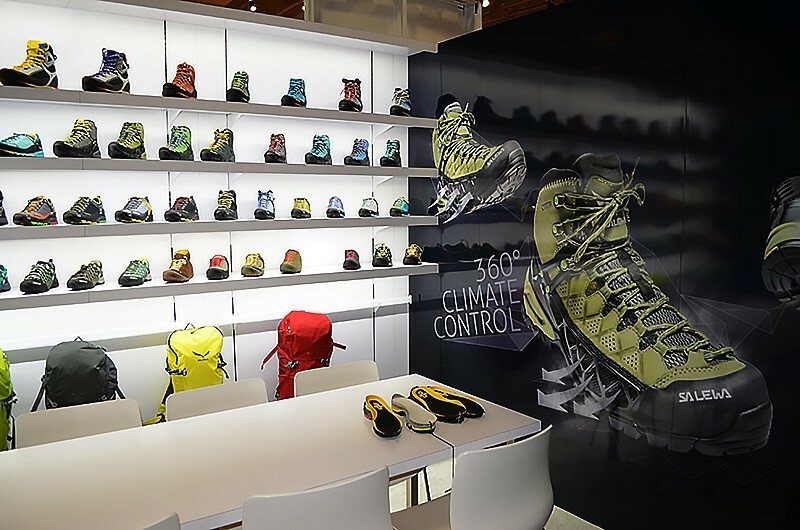 The Vibram booth by mackenzie EXHIBIT drew heavily from the global nature of both FN Platform and Vibram’s international brand presence to create a design that truly represents our worldwide culture. 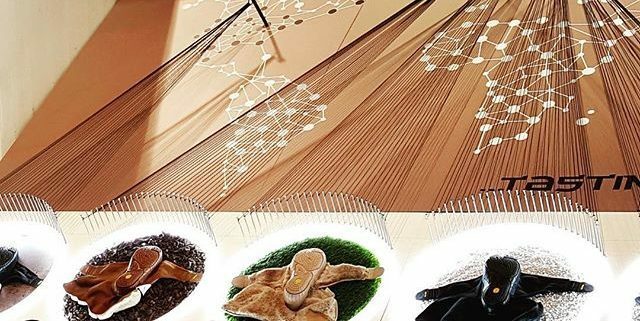 The booth interior featured an installation with a constellation-style representation of the globe with pins placed at international hubs around the world all leading to design aspects of the Furoshiki “wrapping sole” design. This innovative structure allowed for a maximum amount of information to be conveyed in a beautiful and succinct manner and is one of the many reasons why the Vibram booth was tapped for the FN Platform Most Innovative Use of Space Award. mackenzie EXHIBIT is constantly reaching for new and fun ways to bring our clients’ ideas to life, a perfect example of which can be seen in the Vibram booth. Do you have an idea in mind but you’re not quite sure how to communicate it to attendees at your next trade show? Contact us and let our expert team of designers and project managers take it from here. mackenzie EXHIBIT is proud to announce that we have officially teamed up with outdoor industry powerhouse, Osprey, as their new trade show exhibit partner. This partnership will kick off with a booth at Interbike in Reno, Nevada this September followed by Outdoor Retailer Winter Market in Denver, Colorado in November with many more shows to come over the next several years. 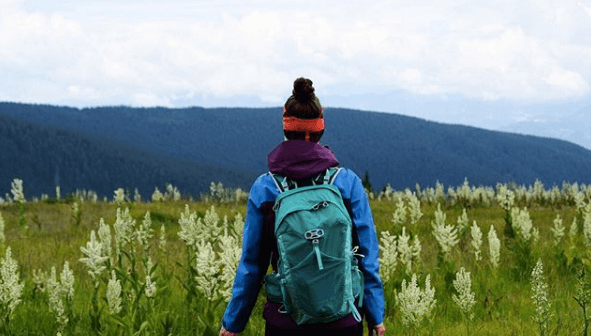 Osprey is one of the most well-respected brands in the outdoor industry and is beloved for creating packs and other gear that marry beautiful aesthetics with unsurpassed performance. We at mackenzie EXHIBIT are honored to have been selected after a thorough proposal process and look forward to a long and successful relationship between our two companies. Stay tuned to see what kind of magic we cook up together! Just building a booth is so 2017. For CES 2018, mackenzie EXHIBIT didn’t just build a booth for one of our clients . . . we built a neighborhood. The award-winning CES 2018 Vivint Smart Home Booth was built to showcase Streety, a cutting-edge communal mobile app focused on improving neighborhood security. 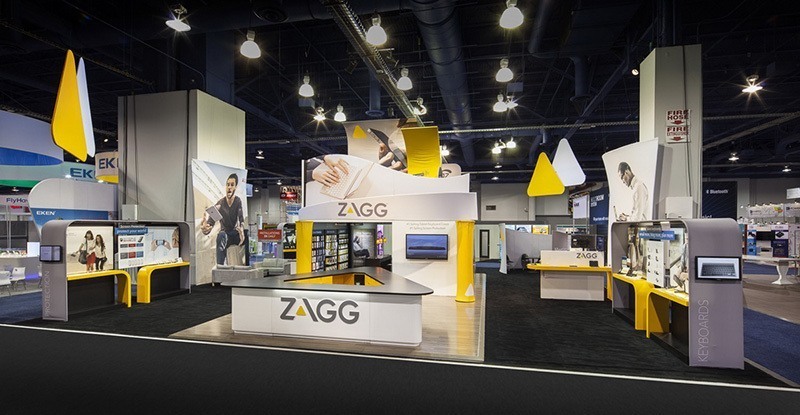 This project was intended to showcase the app’s capabilities on a large scale, all squeezed into a 50’ x 80’ booth space at the Las Vegas Convention Center. Let the creative problem solving begin. The whole point behind the Streety app from Vivint is that it helps to connect the security footage from all of the exterior home cameras in the neighborhood in order to create a proverbial quilt of coverage as the whole community works together to keep their area safe. This isn’t like a normal home security camera system where you’re focused on what happens inside a single building — it’s all about blanketing a large area. To convey this capability, we had to think outside of the box — literally — and make what would normally be a single booth structure into an entire network of buildings. Rather than create a single booth, we worked with Vivint and decided to go the route of taking on the near-impossible: building an exhibit space that felt like an entire neighborhood. With over half a dozen smaller structures fit into the 50’ x 80’ booth space, we were able to create individual little homes with each one focused on a separate aspect of Streety. Whereas most booths focus on sticking to a single design, our challenge centered around how to create many individual booths that all still worked together cohesively under a single brand. What we ended up with was a series of small homes complete with front doors, peaked roofs, sitting areas, televisions, windows, and more. While the structures themselves were fairly straightforward, the really difficult part came into play with the details. Take a look at the pictures of the CES 2018 Vivint Smart Home Booth, and you’ll see all of the hours of hard work that went into making sure each structure felt like a home. Throw pillows, house plants, cutting boards, and even a sink — we made sure all of the t’s were crossed and the i’s were dotted. Heck, we even custom-made the mailboxes that lined the little faux streets. This booth is a perfect example of mackenzie EXHIBIT’s commitment to even the smallest details in order to make sure the final result meets and exceeds our clients’ dreams. By the very nature of an app, you need a screen to be able to interact with it and explore its features. When you first enter the CES 2018 Vivint Smart Home Booth, you’re greeted with three larger-than-life touch screens with which you can immerse yourself into the world of Streety. As you continue through the different mini structures, you’ll be engaging with stories about everything that goes into making Streety so unique, including intelligent video, outdoor 4K smart security cameras, and voice control paired with Google Assistant, all leading to a giant 50’ screen standing two stories tall above a stage where product demonstrations were held throughout the show. A giant hurdle for this booth was how to run the cords needed to power and operate the slew of electronics. To do this without creating unsightly cord bundles or tripping hazards, we actually designed the booth with multiple raised floors that were built seamlessly into the design so that attendees were none the wiser. This allowed Vivint complete freedom with lighting, screens, streetlamps — you name it — anything that required power could get it without hindering the aesthetics of the overall design. When you’re thinking through ideas for your own booth design, keep this element in mind so that you can have more freedom with the placement of electronic elements. The CES 2018 Vivint Smart Home Booth design process was completed two months prior to the show, meaning we had a grand total of 60 days to build an entire neighborhood. If you’ve ever done a remodel on your home or taken part in a construction project, just imagine having to build a home. In two months flat. And that home has to look beautiful and be fully functional. And it even has to have throw pillows and living house plants. And you have to be able to take it apart easily and reassemble it hundreds of miles away. No big deal, right? The miraculous timeframe in which mackenzie EXHIBIT managed to pull off this project is something we will be proud of for decades to come. But hey, just another day at the office, right? One of the beautiful things about working with a full-service and highly-experienced exhibit design company like mackenzie EXHIBIT is that we take care of the setup and teardown for you. It took our experienced crew seven days of all-nighters to get the CES 2018 Vivint Smart Home Booth up and running and looking its very best. You wouldn’t want your company personnel having to do that prior to the show even opening, would you? That’s ok, because we’ve got it covered. To see more images and take a walk-through of the award-winning CES 2018 Vivint Smart Home Booth created by mackenzie EXHIBIT, head over to this link. 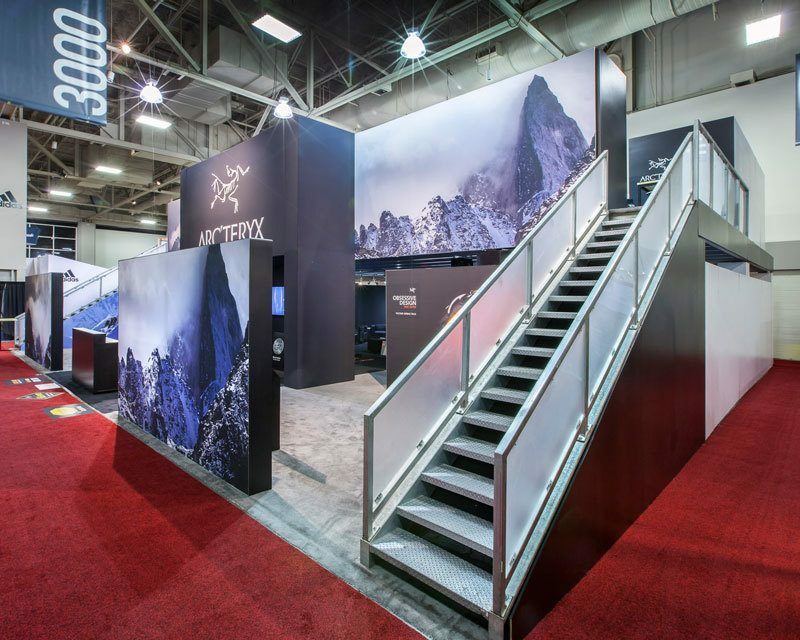 Ready to get started on creating your own jaw-dropping booth design? Contact us and we’ll be glad to help! Your booth design is finished. The graphics look amazing. Products are displayed proudly. The traffic should flow smoothly through the layout. You’re all set, right? Maybe not. 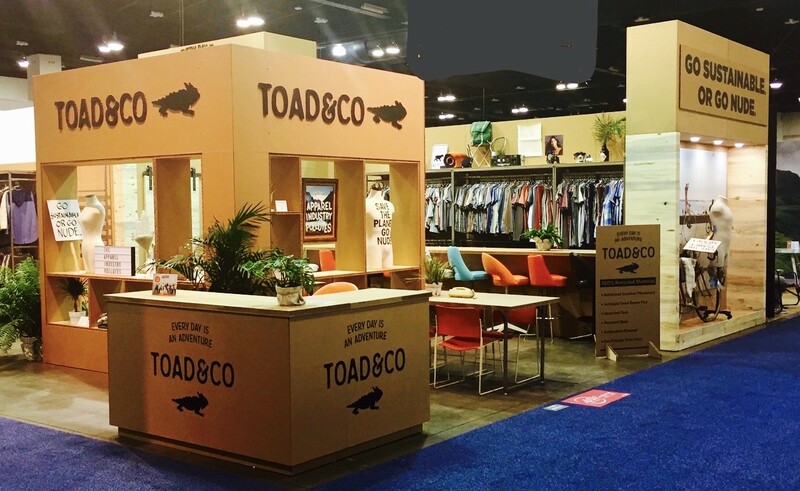 Take a look at these Top 5 Most Overlooked (But Crucial) Booth Elements for some trade show booth design ideas to make sure you have all of your bases covered. 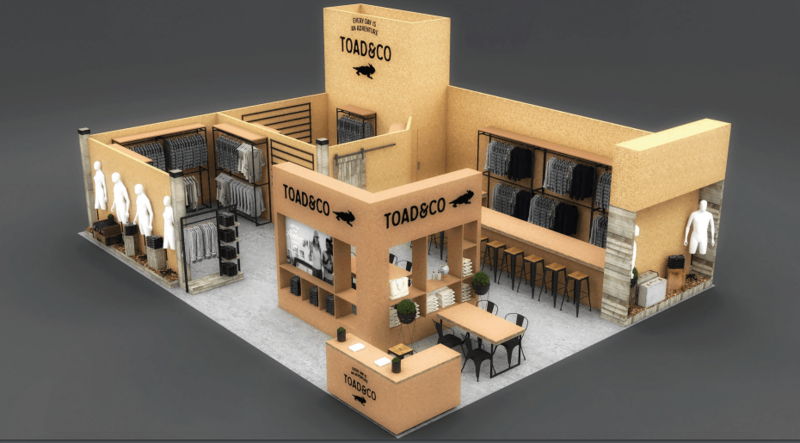 Your trade show booth can be designed as beautifully as possible, but if your employees are in agony from standing on their feet all day, no design in the world will be able to overcome the air of exhaustion in your booth. To ensure you have a successful trade show, make sure you stop and think about how to make your staff as comfortable as possible. Floor padding is one of the top trade show booth design ideas and is the perfect way to save the feet and knees of your booth staff. This padding will be placed underneath the esthetic flooring of your choice (carpet, faux wood, etc.) and will provide some give to the otherwise hard surface. Whether you choose an ultra-plush padding that will only be placed behind a product counter specifically for your employees or you want mid-level padding under your entire booth, both everyone will appreciate this added comfort. You don’t want your employees to be sitting around in your booth all day, but you definitely want them to have access to a place to rest their feet when traffic slows down. There are a couple options: you can either place a few benches behind a product counter so that the seating is hidden from the view of attendees, or you can intentionally create a comfortable lounge space that invites attendees and staff to take a load off. The stools are a great way to keep seating low profile, while the lounge makes your booth feel like a welcoming space for attendees to spend time. Either solution can make a positive impact on your booth, just take the time to consider what you want the seating to accomplish. TIP: From our experience, trade show attendees actually spend more time in booths that have comfortable flooring. After a long day of walking around the exhibit halls, stepping onto a well-padded booth feels like walking on a cloud and they won’t want to leave — which means they’ll spend even more time perusing your products. Win! Nothing ruins a beautiful trade show booth design faster than having a bunch of boxes stacked along the walls or staff backpacks tossed into a corner. You’ve spent a lot of time and effort making sure your booth is exactly what you wanted, so don’t let a lack of storage space ruin the day. Professional trade show booth design companies, such as mackenzie EXHIBIT, can be extremely inventive with ways to incorporate storage into your booth without it affecting the overall design. Product counters, structural pillars, and even benches can be used as low profile ways to conceal items that need to be kept close at hand without being unsightly. These handy hideaways are perfect for boxes of catalogs, swag items, employee bags, and more. Think about how to incorporate this element into your trade show booth design ideas and it’ll make your experience as an exhibitor much more enjoyable. When the booth is slammed during especially high-traffic times, your booth staff can hardly break away to run to the bathroom let alone stand in line to grab a snack or a drink. Keep your booth staff from becoming hangry during these stressful times by providing them with access to refreshments in the booth. Mini fridges and snack cabinets can easily be stashed into a column and make the perfect place to stock bottled water, energy drinks, granola bars, and anything else your team needs in order to stay on their A-game. TIP: Stock up your mini fridge at the end of the day so that when your team arrives for the show the next morning, the drinks are already chilled and ready to go. If a happy wife means a happy life, then happy staff means a successful trade show. Trust us. When your booth is slammed with traffic, there’s a high risk of your products “walking away”. Trade shows are a very dangerous place when it comes to sticky fingers taking your products with them; avoid this hazard by making sure your gear is physically secured to your booth. 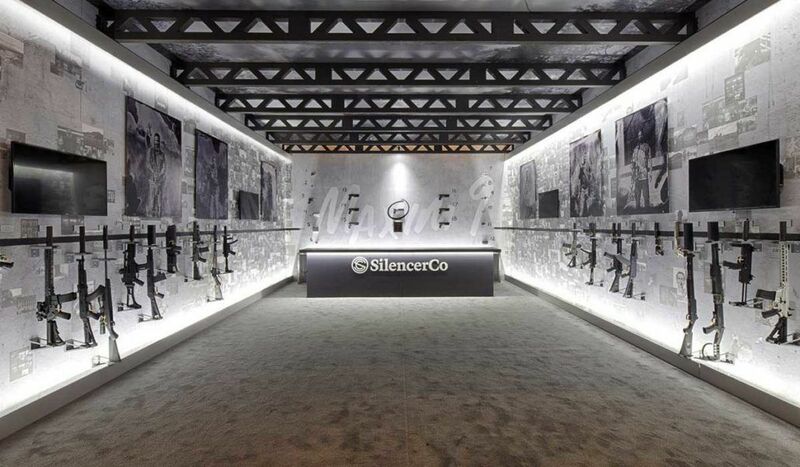 Incorporating security into your trade show booth design ideas can present a unique hurdle — on the one hand, you want to make sure your products stay safe, while on the other hand, you need attendees to have access to your products to become better acquainted with them. mackenzie EXHIBIT can help you come up with an inventive way to accomplish both of these necessities. Whether we’re crafting an easy-access product cabinet that remains closed unless opened by one of your booth staff or we’re creating a low profile tether system so that your products can’t be taken more than 5 feet from the wall, we’ll work with you to devise a solution that suits your needs without negatively affecting the overall booth design. If you’re making sales directly in your booth or your employees are having to set up meetings while at the trade show, a dead phone or computer can really put a damper on your productivity. Avoid this potential pitfall by incorporating power sources in unobtrusive locations throughout your booth — consider adding them in the storage areas we mentioned before so that all of the potential clutter can be contained to one area. TIP: As with products, personal effects can also have a habit of “walking away” during trade shows — especially electronics. Don’t put your employees’ electronics at risk by placing power sources in easily-accessible areas. Instead, try to place them inside lockable cabinets or otherwise securable spaces. 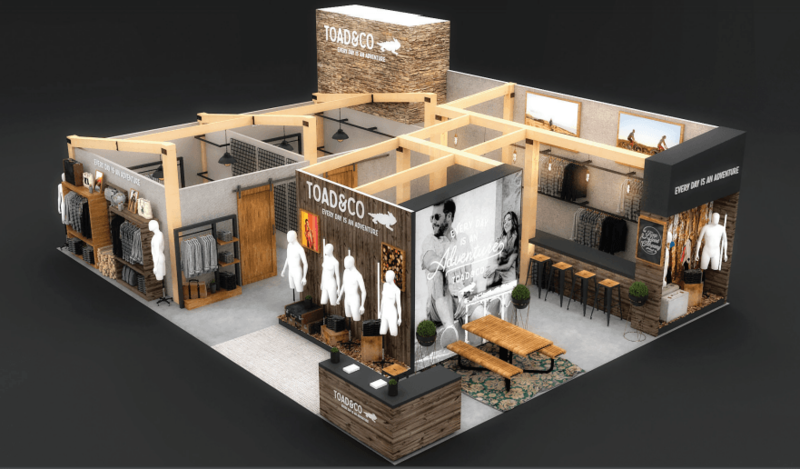 Take these Top 5 Most Overlooked (But Crucial) Booth Elements into account when making your list of trade show booth design ideas, and you’ll be set up for a successful event. Want more advice on how to have a successful trade show? 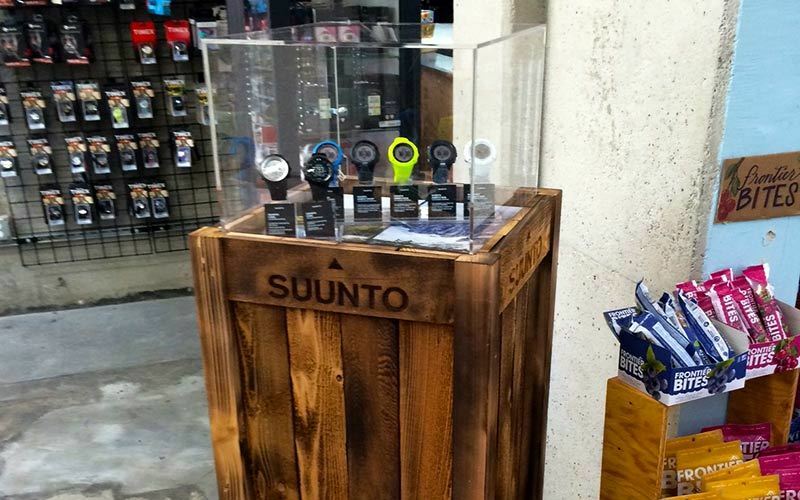 Check out our four-part series on Creating a Trade Show Booth.